There’s nothing like a dinner that makes the whole family happy, which is harder to pull off than you might think. My tot isn’t excited about this or the husband isn’t in the mood for that. So the other night, when I tossed together this seriously simple dinner, I was amazed when everyone asked for seconds — and thirds. Along with being healthy and a go-to weeknight dinner, this dish also cooks in one pan, making it fitting with this month’s Shine Supper Club Challenge. 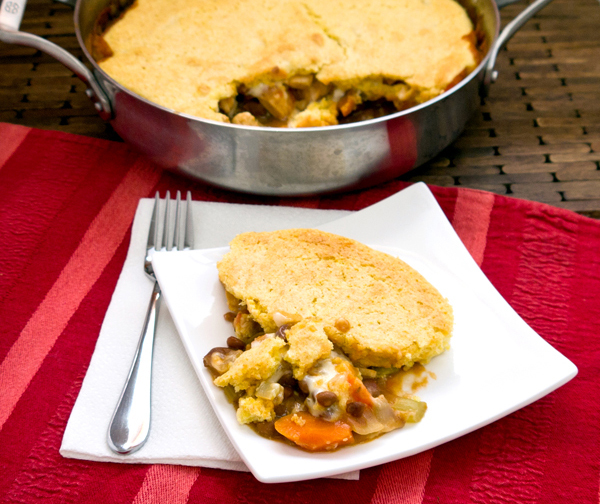 With tasty one-pot dishes as the focus, I knew my twist on chicken pot pie would be perfect. With a little help from pre-made cornbread mix, a can of beans, fresh veggies, and my new Calphalon 3-quart sauté pan, this spicy twist on the traditional recipe is a fun dinner and makes enough for lunch the next day. With Thanksgiving right around the corner, you could also swap the chicken for shredded leftover turkey, which would also be seriously delish. Place a 3-quart sauté pan over medium heat and drizzle with vegetable oil. Chop the onion, carrot, and celery and add to the pan, giving a stir. Once the vegetables have cooked for four to five minutes, chop and add the garlic as well as the chicken. Give things a stir and then sprinkle with the salt, paprika, and oregano. Allow the ingredients to simmer together for around five minutes, or until the chicken starts to brown. Deglaze the pan with the apple cider vinegar then strain and add the beans. Go ahead and add the salsa and water, creating a nice bubbling pan of goodness. Let the mixture simmer while you grate the cheese and make the cornbread muffin batter. Preheat your oven to 425F. Follow the directions on the cornbread muffin box, mixing with the milk and egg. Don’t forget to grate the cheese, and you could totally use cheddar instead of Monterey Jack, which would be tasty too. Stir the chicken and then turn off the heat. Sprinkle with the flour and mix together until it’s incorporated. The flour will help pull the liquid together, creating a really flavorful sauce. You can also add a few dashes of hot sauce if you like things nice and spicy. Sprinkle the cheese over the mixture and then cover with the cornbread mix, using a spoon to spread the batter evenly around the pan. Pop the spicy chicken pot pie in the oven and bake for 20-minutes or until the top is golden brown. Serve with extra salsa, a dollop of sour cream, a fresh salad — or all on its own for a delicious weeknight dinner.